Published: June 29, 2016 at 03:38 p.m. Updated: Aug. 17, 2016 at 10:39 a.m.
College Football 24/7's "16 for '16" series continues with a look at 16 of college football’s fastest players. Some players on this list have proven their speed not only with school-recorded 40-yard dashes, but as track standouts as well. In fact, the No. 1 player on the list competed for the U.S. in the Summer Olympics. The Wolverines' do-it-all star revealed he was clocked at 4.34 seconds in the 40-yard dash on Monday. It's an especially remarkable time given that Peppers is listed at 208 pounds, heavier than any other player listed here. As such, it's of little surprise that Peppers was also named one of CFB 247's most freakish athletes, as well. Peppers' reputation for speed was earlier forged at the high school level, where he won New Jersey 100- and 200-meter state titles in back-to-back years, including a 10.52 time in the 100 meters in 2014. Washington's most versatile athlete on the field is also its fastest. In March, Ross led the team's Husky Combine 40-yard dash testing with a clocking of 4.25 seconds, blowing away the field and runner-up Budda Baker, the Huskies' star safety, by a tenth of a second. And it's not the only time Ross has clocked under 4.3 at UW; he won the Husky Combine in 2014 with a 4.29. Despite missing all of last year with an injury, Ross has three kickoff returns for touchdowns in his career. Bryant doesn't run track like others listed here, but there is no doubt about the third-year sophomore's speed. The Bulldogs have clocked Bryant at 4.24 seconds in the 40-yard dash, and if that number sounds familiar, it should. Chris Johnson's NFL Scouting Combine record for the 40-yard dash is 4.24, as well. After he clocked a 4.25 prior to last season during team testing, Bryant wasn't shy about letting people know. Bryant was also named one of CFB 24/7's most freakish athletes, as well. The Golden Gophers need a big year from Myrick, who will step into more of a leadership role in a secondary losing three starters. One thing's for sure: he's not too slow for the challenge. Minnesota tracks player speed using GPS devices, which have clocked Myrick as fast as 23.4 miles per hour. How does that translate to the field? According to the school, the same GPS system measured him at better than 21 mph on this 100-yard kickoff return against Northwestern in 2014. Myrick was credited with a 10.1-second 100-meter dash in high school. The world record is 9.58 seconds. Burt qualified for the NCAA Championships in the 110-meter hurdles event in June. He was one of only two freshmen to do so. He ran a 14.32 there, but had a 13.91 time to finish as the runner-up in the Big 12 meet. In the fall, Burt showed plenty of promise as a young wide receiver for the Longhorns, starting every game and leading the team in receiving yards (457) and yards per catch (16.3). Although Brandt-Sims has yet to make a big impact on the football field for the Cardinal, you'd better believe speed isn't what's holding him back. He turned in the best 100-meter dash time on the Stanford track team during the outdoor season (10.73 seconds) and its second-best time in the 200-meter event (21.46). During the indoor track season, he turned in a 6.81 60-meter time that missed a school record by 0.01 seconds. As a sophomore at TCU, Echols-Luper posted a 6.89-second 60-meter dash time and a blazing 20.39 in the 200 meters. He turned that speed into All-Big 12 Honorable Mention honors as a return specialist in 2014. He transferred to Arkansas State and sat out last season under NCAA transfer rules. Hines' speed earned him playing time as a freshman last year. He played both running back and receiver, but he made his biggest impact as one of the nation's top kickoff returners. Just ask Clemson. Hines, who is also a member of the N.C. State track squad, has recorded a 6.74-second 60-meter dash and a wind-aided 10.42 time in the 100-meter dash. Whitfield entered the collegiate ranks with a reputation for speed, having clocked a 4.37-second 40-yard dash in high school. He wasted no time putting that speed to use as a prolific kickoff returner his freshman year, but his receiving skills took more time to develop. After catching just 16 passes over his first two years at FSU, he caught 57 balls for 798 yards and six scores as a junior last year. One of the Tigers' most promising defensive backs, Jackson was clocked as fast as 10.30 seconds in the 100 meters in high school, and won the Louisiana Class 4A state title with a 10.42 in 2014. Academic ineligibility knocked Jackson out of spring practice as well as the outdoor track season (he's expected back for football this fall). During the indoor track season, Jackson clocked a 6.63 60-meter dash, but was unable to compete in the NCAA Championships due to a hamstring injury. The Alabama cornerback, a former five-star recruit, ran a 13.81 in the 110-meter hurdles at the NCAA Track and Field Championships earlier this month to earn All-America honors. The football program has timed him at 4.34 seconds in the 40-yard dash. The Tuscaloosa News has reported Brown is facing an indefinite NCAA suspension that the school has appealed. Cannon didn't run on the Baylor track team in 2016, but the previous year, he clocked a 10.58 100 meters at the Big 12 Championships and qualified for the NCAA Championships in the 4x100 relay, as well, where his relay team clocked a 39.80. On the football field, Cannon wasted no time establishing himself as one of the Big 12's most prolific deep threats as a freshman in 2014. He's averaged 17.6 yards per catch for his career. Johnson placed third in the Pac-12 Track Championships with a 10.41 100 meters in 2015, and during the indoor season he established a school record in the 60-meter dash (6.66). Johnson reportedly arrived at UA already as the team's fastest player in 2014 with a 4.34 40-yard dash. He's primarily a kickoff returner for the Wildcats, and averaged 25.5 yards per return last year. 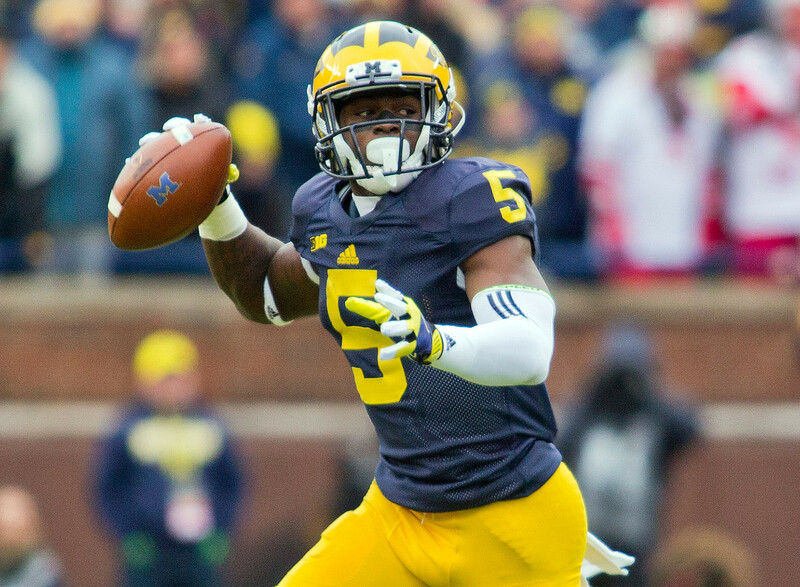 This is the third consecutive year Muhammad has made CFB 24/7's list of the game's fastest players. He ran a personal-best 10.44-second 100 meters as a sophomore. As a junior this year, he turned in Cal's top times in multiple events in both the indoor and outdoor track seasons. He's also accomplished on the football field -- he has more career rushing, receiving and kickoff-return yards than any returning player on the squad. The Trojans' do-it-all athlete on the football field is also a two-time All-American in track. His track specialty is the long jump. He finished 10th in the finals for the event at the U.S. Olympic Trials this month. His accomplishments as a sprinter leave no doubt about his speed. Jackson was clocked at 10.41 seconds in the 100 meters and 21.08 in the 200 meters during the 2016 outdoor season. He also blazed a 6.75 60-meter time in the indoor season. Jackson's wheels translate to the football field in all kinds of ways, such as this punt return for a score against rival UCLA last November. Last fall, it was fair to wonder if the Ducks' wide receiver/track star had lost a step due to a knee injury. Now, it's fair to assume he hasn't. Allen is representing the U.S. at the Rio Olympics. He finished fifth in the men's 110-meter hurdles on Aug. 16. He won his second NCAA title in the 110-meter hurdles event in June with a time of 13.50 seconds, and earlier in the track season, he posted a 100-meter dash time of 10.36. Understandably, Allen is pondering his future in both sports. Two years ago, Allen clocked the second-fastest 110-meter hurdles time in NCAA history at 13.16. The knee injury happened against FSU in a College Football Playoff semifinal.